I finished my second 5K Saturday morning. 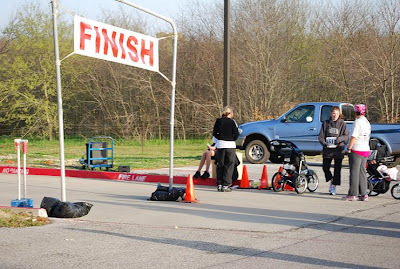 It was the Spring into Action 5K Fun Run and Walk benefiting the Women and Infants department at Texas Health Presbyterian Hospital Kaufman, TX. They announced on site that they had over 250 registered runners. My goal going into the race was to break 40 minutes, I finished in 38:47. Next up is the Capitol 10K in Austin on April 11th. I have no dreams of running that course. I plan on walking, jogging,taking pictures and having fun along the way. The Fountain 5K and Walk is on April 17th, during the Terrell Heritage Jubilee. The race will benefit Volunteer Services Council of Terrell State Hospital. A full schedule of events for the Jubilee can be found here. The Tigers baseball team will travel to Forney Tuesday night for a district game against the Jackrabbits. The Tigers will then host Lancaster Tigers Thursday night. The team has started slow in district play, but starting with the game against Lancaster, Terrell will have 5 of the final 7 district games at home. Hopefully, the home field will give them the boost needed to make the playoffs. I added a couple of photo sets to the Facebook page. Follow the link on the right to check out photos from Dallas Blooms, Tiger baseball and the 5K Run in Kaufman. There is a story on the Terrell Tribunes site that has generated quite a few negative comments about growth, safety and overall quality of life in Terrell. I would like to direct the anonymous commenter's to the City of Terrell's website where they can apply for the Terrell Citizens University.